Tari Prinster is a cancer survivor and yoga teacher since 2003. She is also the founder and director of our yoga4cancer program; and the founder of a nonprofit, The Retreat Project, that helps to bring specialized yoga classes and retreats to cancer survivors. Here, she talks with us for our Huffington Post Blog series on yoga service. Rob: What emotionally motivates you to give back the gift of yoga? Tari: Thirteen years ago, I was diagnosed with cancer; it literally took my breath away. I was caught off guard by how this made me feel like an invalid. It stole control away from my life. How could I go from being healthy to being sick, weak, and powerless? And this was not the most surprising part of it. Then came the treatments, which weakened my health, strength, and happiness more than the cancer. Everyone said, “Go home and take it easy,” but I needed help to stay strong. At the time, I was already a yoga practitioner, but it was largely in the name of vanity. My own practice immediately took on a greater importance. I tried to stay normal by walking, biking and, increasingly, doing more yoga. I learned not to live in fear of losing my life, but rather to embrace what I have. By getting so close to losing it all, I was liberated to focus on the things and people that really mean the most to me. The lessons from my cancer have been the most powerful of my life, and actually I am often thankful for my cancer. It has made me a better version of myself. Yoga also helps me be a better version of myself, as it did the whole way through my cancer treatments and recovery. I feel strongly about sharing this healing tool with others, as I know others are feeling that same lack of support in staying strong. Yoga can be their remedy, too. 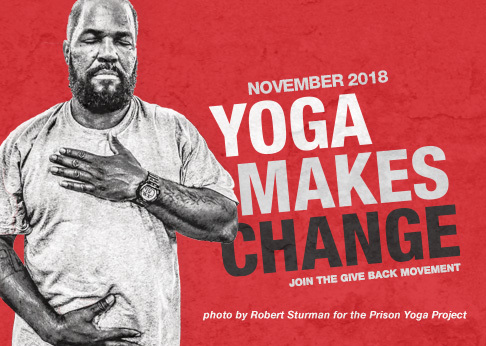 What changes occur during our asana, pranayama, or meditation practices that help us get off our mats and “give back” to our communities the benefits we’ve received through the practice of yoga? The transformative nature of yoga, like cancer, changes your life forever. Through it we learn balance, harmony, goodness, and how to be peaceful, strong, and flexible. As a yoga teacher, when I see people who are suffering from the lack of these qualities in their lives, such as cancer patients, it ignites feelings of compassion in me to help them also find this transformative path to health and healing. How did you begin to serve? While I was in treatment my doctors commented on how quickly I recovered compared to others, and I began to ask if it had anything to do with the yoga. I came to a new relationship with my yoga practice through cancer, and I began to wonder why and how I was recovering so quickly and thoroughly, emotionally and physically. Because the doctors couldn’t understand why I was recovering better than others given the treatments that I was undergoing, and because the yoga community at that time had no answers, I began to research on my own and build a program around it. Once I had an understanding of the biological and physical relationship between practicing yoga and undergoing cancer treatments, I began to share a specialized practice with other cancer patients and survivors in need. How can you serve without attachment to the outcome? I don’t. I am attached to the outcomes. I’m attached to helping others find a way to deal with their anxieties, to get stronger, to avoid a recurrence, and to learn how to walk through their fears. But I do serve without attachment in some ways. I have let go of fear of death. I’ve had to let go of my attachment to many students who have been lost to cancer or other disease. At any point a student may not come back to class, not because they don’t like me or the yoga, but because the cancer has taken control of them, and they have either entered terminal stage, or died. There is no predicting where anyone is going to go in their cancer journey. The biggest lesson that yoga can teach, and that I can provide to my students, is to learn to take one day at a time. This means to not become attached to the outcome of that day, other than to be an opportunity to experience what is happening right now. I need to practice this in my teaching as much as they do in their experience of yoga. How do you deal with compassion fatigue? Feeling compassion is different from showing compassion. There are many ways of showing compassion, and some are less fatiguing than others. There is nothing wrong with finding approaches that are less stressful for you — one doesn’t have to give completely and constantly to everybody. Compassion is a broad term, and the expression of it comes in many forms. Compassion is an emotional and physical action that requires energy, effort, and selflessness, by putting one’s needs aside, which can lead to stress and loss of emotional balance. We cannot really give contentment, ease, and compassion. As we seek to help those we serve balance suffering and contentment, illness and well-being, we can only model that in our own lives. We can give witness to the suffering of others, but we must first give witness to our own suffering. Take care not to deny yours. It is my responsibility to respond well to my students — to recognize the symptoms in myself. Think, am I being-self absorbed, detached or preoccupied? Being honest with everyone, not just students, and being able to say “I can’t respond to this right now,” is important for all of who try to give back. How do you model leadership when working with unserved populations? By doing what I do: providing access to safe yoga classes at a reasonable cost with teachers who have been thoroughly trained. Also by providing scholarships to retreats and ways for people to discover yoga for the first time. Taking responsibility for one’s health and future is the most important part of one’s own healing process. I practice this myself, and encourage students to do the same. It’s not something the medical profession can give to us; it is something we have to create and maintain for ourselves. Owning that process changes everything. Staying healthy isn’t going to happen easily; it’s an ongoing challenge with daily choices. Without effort, change won’t happen. No effort is a loss. I teach students to walk through their fears. It is most beneficial to walk through fear of change, of pain, of lack of control, by doing things that are challenging. What students need and want is to be treated normally. In the process of being treated normally, they are going to get stronger. If the practice is just restorative, and not an effort to be normal and gain strength and stability, it’s much less effective. My dream is that Western medical professionals and hospitals recognize that yoga taught by specially-trained and specifically-certified yoga teachers is the final prescription a cancer patient/survivor needs in his or her healing process. They can prescribe yoga for life, yoga for all the life-long side effects that will be there, regardless if the cancer is not. Learn how to safely and effectively adapt yoga to cancer patients and survivors through yoga4cancer’s teacher training programs.